Edwin will be presenting a paper on the “The Soul of the Music: Gifts from the Golden Age of Piano” to an international audience from over 20 countries. 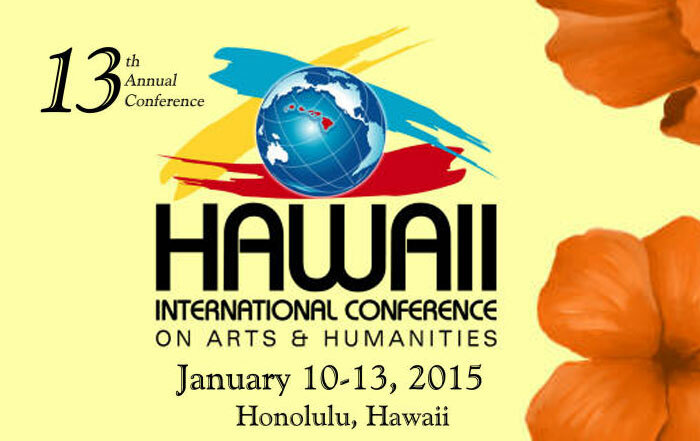 The 13th Annual Hawaii International Conference on Arts and Humanities will be held from January 10th (Saturday) to January 13th (Tuesday), 2015 at the Hilton Hawaiian Village Waikiki Beach Resort in Honolulu, Hawaii. Honolulu is located on the island of Oahu. Oahu is often nicknamed “the gathering place”. The 2015 Hawaii International Conference on Arts and Humanities will once again be the gathering place for academicians and professionals from arts and humanities related fields from all over the world. The main goal of the 2015 Hawaii International Conference on Arts and Humanities is to provide an opportunity for academicians and professionals from various arts and humanities related fields from all over the world to come together and learn from each other. An additional goal of the conference is to provide a place for academicians and professionals with cross-disciplinary interests related to arts and humanities to meet and interact with members inside and outside their own particular disciplines. The 2014 conference was a great success! It was attended by more than 400 participants representing more than 26 countries!